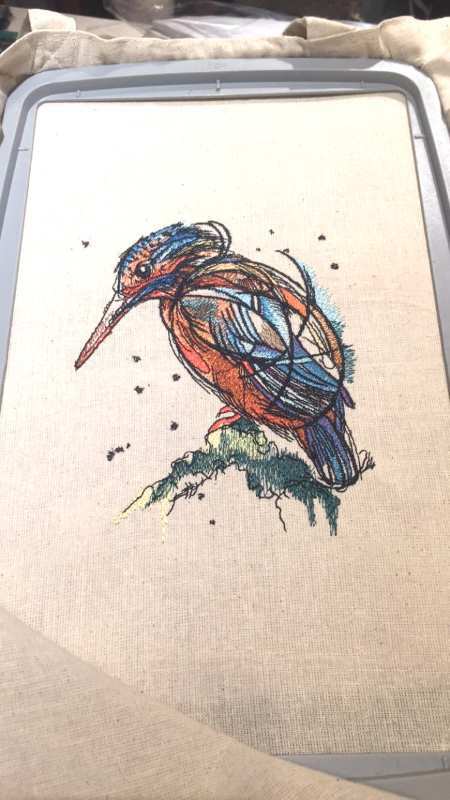 Check out this beautiful machine embroidery design coming up next in our vast bird collection! It features a colorful bird sitting on a rock. This needlework masterfully combines watercolor and sketch techniques. The bird has luxurious plumage the colors of bluestone, saffron, aqua pearl, pumpkin, wonder blue and chocolate. It also has a long beak and a curious black shining eye. This beautiful embroidery design will be such a great addition to any items, for example cushions, napkins, tablecloths, quilts, bed linen, blankets, towels, pajamas, sweaters, hoodies, T-shirts and much more. Beautiful bird design! It looks great both on a blouse and interior things. Stitched out the design recently, it would a great gift for my friend! Thanks to the seller for good service! Sewed with Brother 535 on the days. Great pattern! 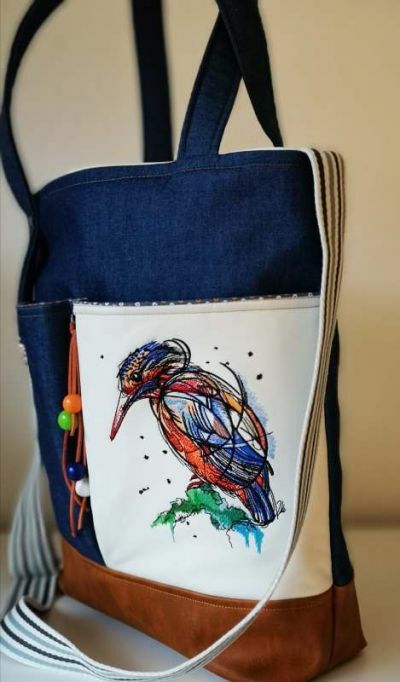 Many colors, but it is easy to change the color card and the bird looks great anyway, thanks to the designer) Great embroidery designs! I will surely buy from this seller again! I was wondering if I can sell items I make with your character embroidery on them, I.e, teddy bear, bird , princess, e.t.c or would I be breaking copyright laws? I can’t see anything about it on your site and am unsure of the rules. There are no projects to use these projects in your commercial activities. 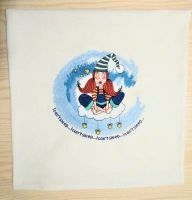 You can sell embroidered items at your fairs or shop. Wonderful pattern! Thank you for digitizing such pretty birdie design! 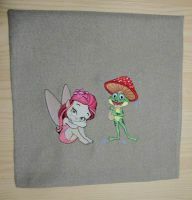 I've decorated my pillowcases using it and planning to sew the pattern on my t-shirt. I'm sure, it would be beautiful. Thanks! What embroidery machine you using? Hoop size? Where you try open it? In software? What embroidery software you have? I want to try open it on the software on the PC all the other orders I can open but the last order doesn’t work. My embroidery software is Janome digitizer pro v2.0 (an old version but it still works) I can open all the other orders except the last order strange. Sorry for my bad english but I’m from Holland and hope you can follow my explanation. We check all files and not found problem. We attach order and sent via e-mail. Thank you! this was so much simpler to download, again, Thank You! How can this design be used. A comfortable leather bag with machine embroidery, decorated with an interesting stylized pattern will be one of your favorite accessories. 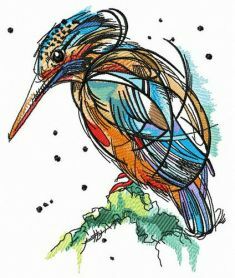 The design of the bird is made in the style of a sketch drawn with watercolors. Machine embroidery on the skin, the process is not easy and requires careful preparation. The size of the bag when folded is 30.5 x 33 cm or 30.5 x 48 cm. Stabilize the skin or imitation leather with a duplicate, gluing it with an iron in accordance with the recommendations of the material manufacturer. Place a detachable or detachable stabilizer in the hoop, put a layer of glue-spray on the stabilizer. Glue the skin on it. To heal the skin is not recommended. This can lead to the fact that the material will remain traces of the hoop, which are difficult to remove. 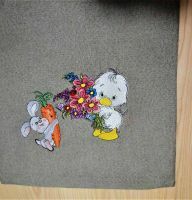 At the end of embroidery, do not remove the stabilizer, it will additionally seal the bag walls.